This paper examines the performance of the spatial arbitrages carried out between two regional markets for wholesale natural gas linked by a pipeline system. We develop a new empirical methodology to (i) detect if these markets are integrated, i.e., if all the spatial arbitrage opportunities between the two markets are being exploited, and (ii) decompose the observed spatial price differences into factors such as transportation costs, transportation bottlenecks, and the oligopolistic behavior of the arbitrageurs. Our framework incorporates a new test for the presence of market power and it is thus able to distinguish between physical and strategic behavior constraints on marginal cost pricing. We use the case of the "Interconnector" pipeline linking Belgium and the UK as an application. Our empirical findings show that all the arbitrage opportunities between the two zones are being exploited but confirm the presence of market power. 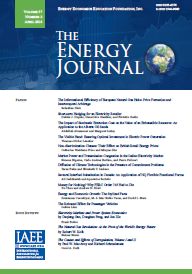 Published in Volume 39, Special Issue 2 of The Quarterly Journal of the IAEE's Energy Economics Education Foundation.